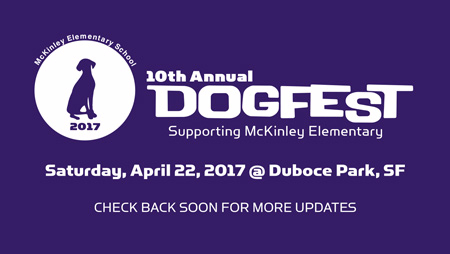 The 10th Annual DogFest is happening this Saturday 22nd April from 11am – 4pm. Come down to Duboce Park for fun and games. There will be food, a bake sale, carnival games, merchandise, a raffle with fantastic prizes, inflatable obstacle course, and a Rescue Zone featuring local dog rescue organizations. Our Silent Auction features a wonderful assortment of items to bid on. And of course there is our amazing Dog Show, emceed by Daniel Handler with special intermission entertainment. Visit the website here and the official Facebook page here.